I enjoy the Twilight series books and movies. I'm not sure what it is, and it really doesn't matter to me. I think the movies are romantic. When a bakery names a product after a character, I believe it gives that product a life of its own. Customers remember unusual names of cupcakes. 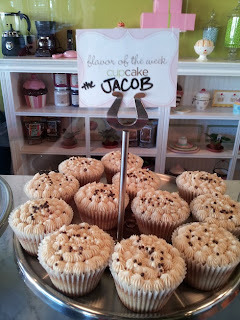 For instance, a person would remember "The Jacob" over "mocha cupcake" because it is more interesting to them. I'm not implying that all confections should have a specific human name by any means. What I am saying is that from a marketing perspective, it's a good idea to play up trends, fads, movies, songs, or whatever is currently popular. Let's say it's Election year. Imagine having the "Clinton" and the "Bush." Obviously not all names work, and that was a bad example. LOL So be careful with what names you pick for your confections. (I'm cracking myself up at these references by the way). This beautiful platter of cupcakes courtesy of CupCakeBite in Fuquay, Varina, NC.